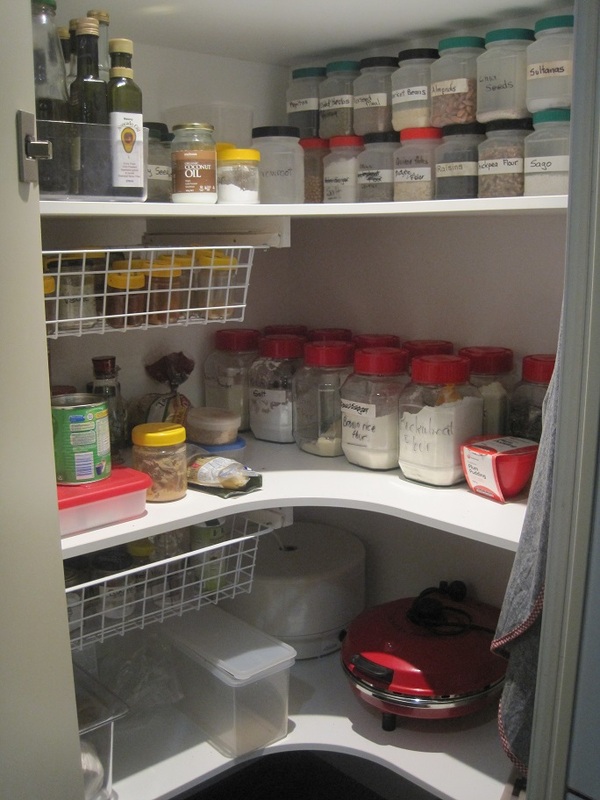 This is a follow-up post about my reorganising of the pantry. You can read the initial post here. Once again, there are no before photos which may be just as well because it was not a pretty sight. My pantry has been been well-organised on previous occasions, however, a few things had conspired and it had spiralled out of control. This version is a complete departure from my previous methods. I have decided to group the jars by the type of contents rather than by size. This means that all of the dried fruit is together, then several types of sugar, various flours and so on. I will be interested to see how this works out. Here are a selection of views of the shelves. Not everything has been placed as yet and I still need to update the labels on some containers. The top shelf has roasting pans, the dehydrator and pizza maker. The next 2 shelves are primarily devoted to all of the ingredients which I buy without packaging and store in a selection of containers. The lower shelf is the grocery items that I buy plus any home-made jam, chutney and sauce. The breadmaker and food processor are also stored here. Note: The food processor was in use when the photos were taken. The stockpot and tub containing the attachments for the food processor stand on the floor. The paper bag on the far left is where I keep unrefrigerated vegetables such as sweet potatoes and garlic. You may have noticed the 2 wire baskets under the shelves. These are screwed to the underside of the shelves and roll out. They are some of my favourite features of the pantry and I use them to store small containers. The upper drawer is for spices and a substantial part of this organising was devoted to the spice drawer. I have gradually been collecting an assortment of glass Vegemite jars for storing the spices which I buy from a bulk store. The jars are about 4 different sizes so I have chosen to utilise them according to the amount of each spice that I generally keep on hand. They are now labelled on both the jar and the lid for easy identification. There are still a few more to add. The other drawer has yet to be sorted out. One of the results of this job has been to locate various items that needed to be used up and identifying a few things that I will never buy again. I try to avoid recipes/meals that incorporate huge numbers of ingredients that are outside of my regular selection and stick to basic ingredients that can be used in many different ways. Since I buy all of my dry goods from bulk bins, I need to have storage containers for my pantry. Some are glass and others are plastic but most are screw-top jars that I have either inherited from my mother or collected from various sources over a period of time. This photo gives you an idea of what my pantry looks like on a good day. This is an old photo and some things have been moved around but you get the general idea. However, it has been quite some time since I last cleaned and tidied it properly and it definitely starting to show. I really need to keep larger quantities of some of the ingredients in the small plastic jars so I have been considering my options. A couple of weeks ago I was in one of the local charity shops (there are 4 in our small town) when I spied some large glass jars. They are Moccona coffee jars and have a tight-sealing lid. I bought all 5 of the largest size for $4 each. Today I optimistically checked to see if there were any more and was surprised to find another 4 matching ones. I now have 9 large glass canisters which are airtight and cost me the princely sum of $36. I will do another blog post with photos once the pantry is sorted out and the new containers are in place. I think I am finally back on track and hope to have regular blog posts for you most days. I have finally caught up and replied to all of your comments. There has been a lot going on and I am working on a few different projects as well as the routine stuff and a full-time job. Since I buy a large percentage of my groceries from bulk bins and bring it home in reusable bags, I decant it all into sealed containers in the pantry. Even though it is all in reused jars I like the idea of having matching containers. In order to achieve this I have tried to limit myself to just a couple of different jars and I am quite pleased with how it looks. The labelling has been a bit hit and miss though. The Duke finds it a bit intriguing that the raw sugar lived in a jar labelled ‘Quinoa Flakes’ and so on. Over the past couple of weeks I have been working on improving the labelling. The catalyst was the fact that we will have housesitters staying here while we are on holidays in a couple of months. I have not finished it completely but enough is done to give you an idea. I have also labelled the spray bottles in the laundry that have pre-wash spray, diluted clove oil and window cleaner in them. It amazing what we just accept as the norm in our own homes but it is an interesting exercise to stop and think about how a stranger would view your ‘systems’. Firstly, I apologise for the lack of posts this week. I have been busy with other things and have just not found the time to get my head together to write anything useful. I am also behind in responding to your comments but am about to rectify that once I finish this post. I will be busy this weekend but hopefully things will get back on track from Monday. I hope you have a great weekend. I cook most of our food from scratch, so naturally I keep a store of the ingredients I use regularly. I do not store tonnes of food in case of an apocalyptic event, however, we do have enough so that I only shop for dry goods about every 3 – 4 months. I never run out of everything and I never feel the need to race off to the shops at the first hint of a severe weather event such as a cyclone or possible flooding. These are the 2 most likely scenarios where we live. We eat a gluten-free diet so I have gradually eliminated all wheat-based products from the pantry. 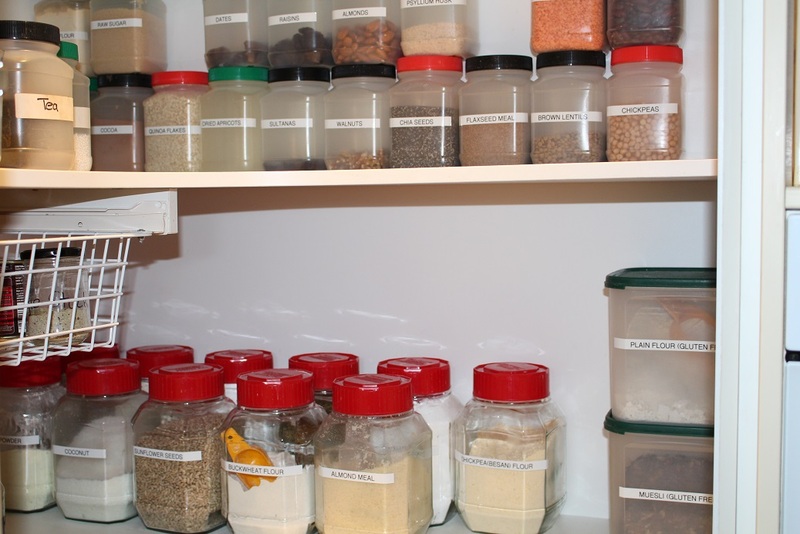 Most of the dry goods are bought from bulk containers so I store them in glass or plastic jars in the pantry. I have some 10 litre plastic buckets which I keep excess of some items in. These are in a separate store cupboard. I may have missed a couple of things but that is basically what we keep. Some of the items are left from before we changed our diets so are unlikely to be replaced. How does my list compare to what you have? Any thoughts, suggestions or questions?